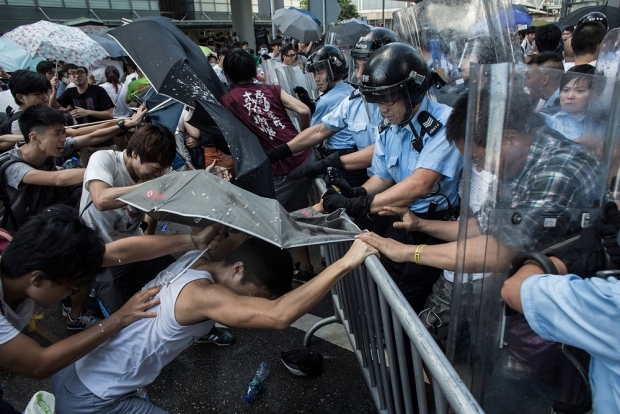 Protesters clash with riot police outside of the Hong Kong government complex on September 27, 2014. 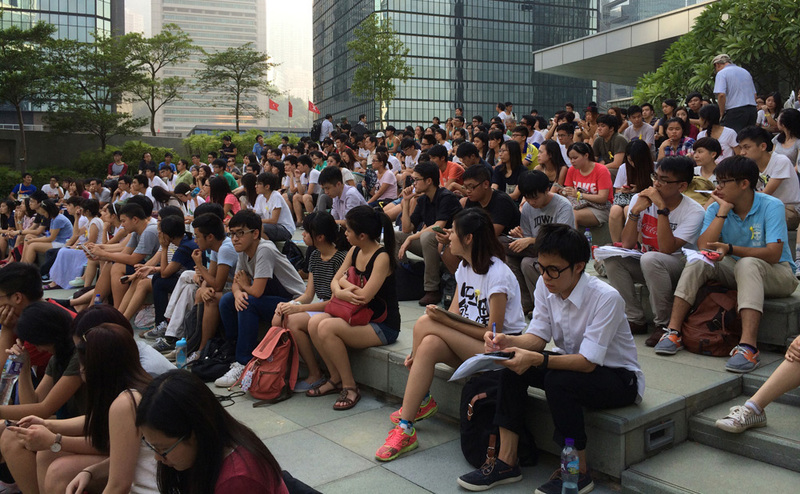 Thousands of students started a week-long boycott of classes to protest against Beijing’s conservative framework for political reform in Hong Kong. A week ago today I sat together with you outside the Chinese University of Hong Kong’s library, a teacher among other teachers, a university member beside students, 13,000 strong. 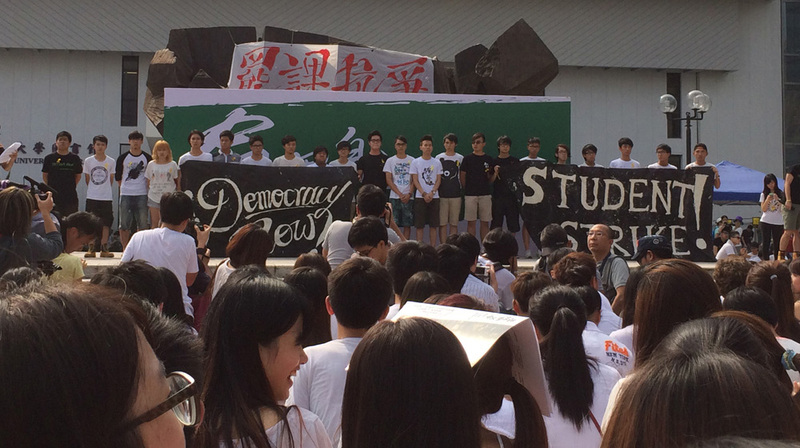 The weeks before had felt quiet: at the three previous all-student meetings around the Goddess of Democracy statue, you listened respectfully to guest speakers—past student union presidents, a student who had been arrested on July 1, Leung “Longhair” Kwok-hung from the League of Social Democrats. There were not many of you, but you raised your hands and made gentle suggestions about what time last Monday’s rally should start, about how you could be photographed studying outside of class, about making public art by folding paper stars. So I was surprised when I arrived at the campus plaza on Monday. Under a relentless late summer sun, you filled the entire campus mall. 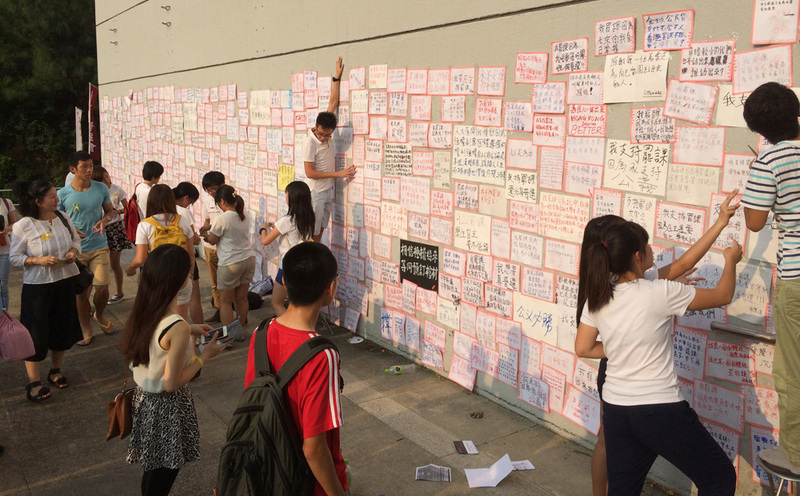 On the impromptu stage, white banners read, “Student Boycott, Take a Stand!” and “Be the master of Hong Kong’s future!” Throughout the afternoon a “Democracy Wall” rose at the far end of the crowd; some of the messages you attached to it simply gave support for the strike and Hong Kong’s democracy, some of you filled poster-boards to the brim with righteous indignation: “The National People’s Congress has seized our right to universal suffrage…you are not the emperor!” You bore brightly-colored flags that bobbed in the sunlight, representing your universities, your departments. The atmosphere was ebullient. You cheered and waved when a photography drone passed overhead. You chanted slogans with yellow ribbons tied around your wrists. You sang songs with your arms in the air. I am inspired by your ability to teach yourself, as you organized activities following the rally and moved to a week-long boycott in Tamar Park. 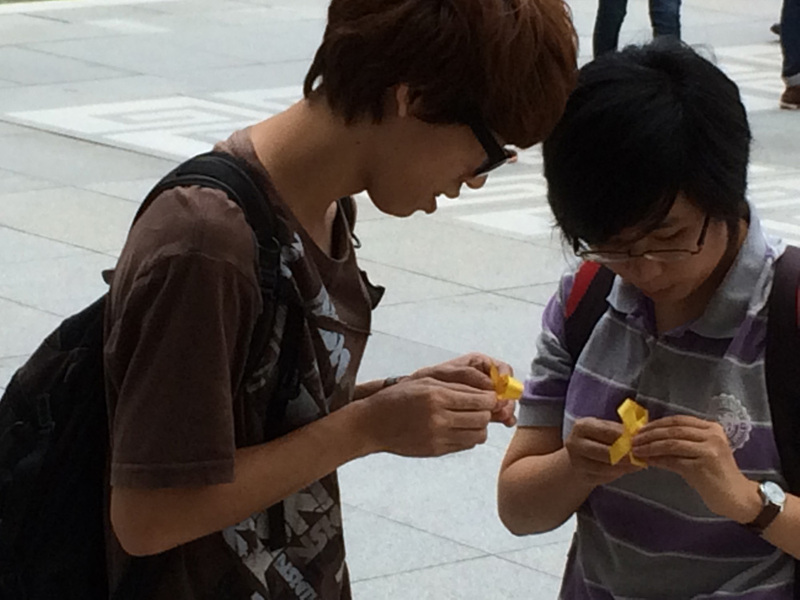 I went to the teach-in and saw your mini-university and watched you streaming between the simultaneous lectures. You had come of your own accord. You were taking assiduous notes. You broke into groups and talked about the meaning of direct action, of civil disobedience, of protest. You wrote to tell me how the boycott made you understand society more deeply, and I smiled when you confessed that it was so far a superficial understanding, that you would have to read more books to combine theory with practice. What teacher would not be filled with joy to watch his students seize learning so independently, so concretely, and with such passion? If we shed tears at this moment it was because we saw how you did not need us anymore, you could learn and act on your own. I am inspired that you are making the student boycott your own. Earlier I had written that you were inspired by May Fourth and the awakening of social consciousness. But observing you I have come to realize that this interpretation is far too simplistic, that initial reportage did not give you enough credit for both adaptation and innovation. Some have invoked May Fourth, and some—like Longhair when he spoke to you—lectured on Gandhi and Martin Luther King. No doubt their examples have inspired you. But reading the Chinese University boycott magazines and your reportage in Ming Pao, I see that your examples are recent and cosmopolitan. You are looking to 1968 in Paris, the 2011 Chilean student boycott, and 2012 in Quebec. You self-consciously organized the preceding campus meetings to follow Quebec, to be as democratic as possible, to give each of your classmates ownership. What I thought had been naïveté was a careful imitation of a model you had identified to be successful. So, though elements of your protests may have historical roots, I salute you for seeking a new model for Hong Kong, one which—your leadership tells us—will influence student movements to come. But as I listened to you, I was and am fearful. During the rally on Monday my eyes followed one of you, my own student, as he spoke on the stage. Was it less than two years ago that he was one of the silent ones in class? When had he grown so tall, so articulate? And where had that beard come from? As I watched you tremble with the rightness of your words, with the fury of the wronged—when you shouted that you would make the Chinese state come to its knees—something clutched my heart with fear. At that moment I suddenly felt old, in a way that wrinkles and grey hair have not chilled me. When I was young, I too had many dreams. I am afraid for you, and as I told my friends on Saturday it is less a fear for your arrest, or bodily injury—although events since Sunday have shown that perhaps I should fear this too. More than this, I am afraid of what happens if and when the world you hope to create does not come to be. When one of you wrote to say that your parents laugh at your foolishness, or when you speak of your helplessness in the face of society’s indifference, I am afraid of your losing your dreams. The self that swelled with pride to see you organize a teach-in is the same me that does not want to see your heart break. You are young, you have barely even been to China—except maybe with your parents on a package tour, or with me last summer—and it is too early for you to be old. I wish it could be otherwise, and perhaps the outpouring of public outrage and support since Sunday will lead to what we both hope for. But I am fearful when I see the indifference that you have already experienced, when a subway car playing footage of handcuffed students does not cause anyone to look up from their mobile phones. I was stricken when, on Sunday night when tear gas caught me blocks away from the protest, I looked up with stinging eyes to see the swarms of people glassed inside the Apple Store, furiously shopping. If these scenes make me despair, and I’m not even a Hong Kong citizen or a permanent resident, what can it mean for you? I am afraid for your loss of faith. On Saturday, a local friend who is a parent and a teacher wept as she wondered aloud why it is that the students are leading and where the grown-ups are. And I cry with her because I don’t know what to do either. But I also wonder if the people you describe as unfeeling, if the parents you describe as too self-interested, if they too weep in the dark. Against my fear, I see that you hope, so I hope for you as well. I am hopeful that through this you will learn better how to teach yourself and teach each other. You want to raise everyone’s consciousness, including your own. You write to me that the boycott will lead your classmates to “break out of the ordinary style of learning, it will cultivate a platform for political consciousness, and it will give us first-hand knowledge of what it is like to face-off against the violence of political power.” This has turned out to be all too true; paper stars have been replaced by goggles, face masks, and umbrellas. 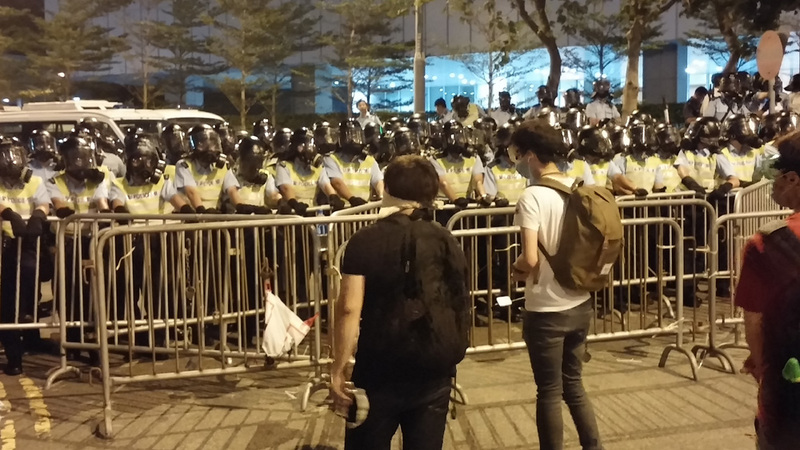 I hope that through this you will better understand Hong Kong society, even if it reveals many dark sides. I see that you are disappointed that not all students are on the boycott, but you join anyway. I know that you realize that there are barriers between the enthusiasm of the student leadership and the participation of the average student. You are heady with the idea that the student movement has set the wheels of Occupy Central into motion, but you are clear-headed enough to know that divergence among various leaderships must be carefully negotiated. Even now, as students dressed in black stream towards University Station and middle-aged women hold up signs by the entrance condemning police violence, you are uncertain of a future course. You have just come to my office to confess that the students are exhausted, that you do not know how much more they can take. If my fears lie in seeing you as still too young, my hopes rest in your being able to stand on your own. In the past weeks you have taught me a great deal, and I know that you are not naive. Some of you openly state that boycotting classes won’t bring true universal suffrage. Some of you maintain that beyond the horizon of these weeks, resistance may one day bring Hong Kong an electoral system that can truly serve the people. In the meantime, my hope is one that you have expressed, that you will “stop for a moment and think about what [you] can do for Hong Kong,” that this experience will enliven how you pursue your studies and your future. Not all of you must be activists, but I hope that you will be active, that the flame you carry today will illuminate your way, in darkness and in light.